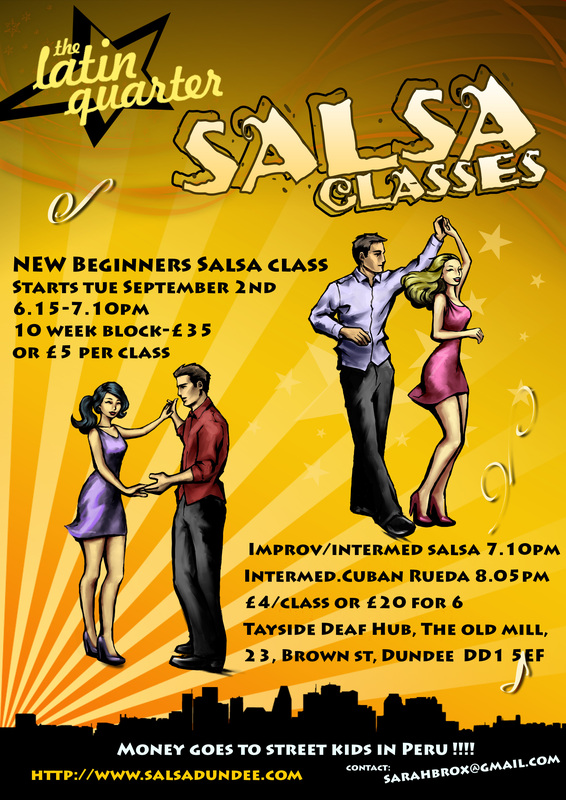 NEW Beginners cuban style style salsa class – 10 week progressive class – starting Tuesday Sept 8th, £5 per class or £35 for 10 week pass. Class will include partner dancing initially leading onto learning the Rueda, the Cuban wheel dance. No partner necessary, anyone welcome. Total salsa beginners can join class first 2 weeks only (students who already dance confidently in a different salsa style can join in week 3 but- please email in advance regarding this). Time : 6.15-7.10pm, at The Deaf Hub, Old Mill, 23, Brown St, Dundee. No partner necessary, anyone welcome. Email sarahbrox@gmail.com for places or more info. Please pass the word. All money raised for Azul Wasi project in Peru. Directions on class page on www.salsadundee.com site.